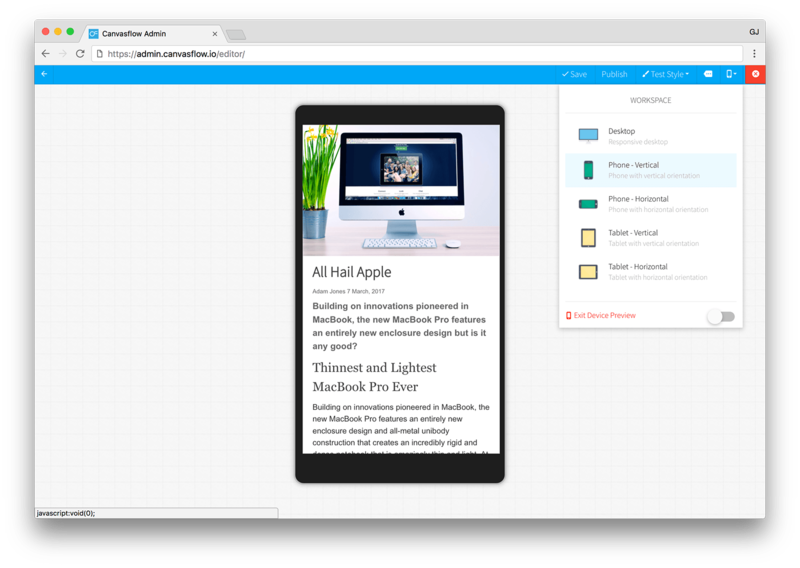 Canvasflow offers the ability to quickly preview an article, style or template in a specific device environment. This feature helps to provide a simulation of exactly how your published article will appear, without the distractions of the editing tools or needing to publish. From the menu, click 'Workspace'. Click the 'Device Preview' button located below the workspace options. The canvas will change to preview mode. Use the scrollbar to scroll up and down the article. If required, click an alternative workspace to preview in a different environment. To exit the preview mode, click the close button (X). Canvasflow offers the ability to set the visibility stats of media components on a device type basis. By default, components that are not eligible for display on a particular device are hidden when the workspace is set to that device type. However, it may sometimes be useful to be able to see which components will be hidden for a particular device. Toggling the device type component visibility allows you to get a better overview of how each component will be affected when changing the workspace. Enter preview mode via the 'Workspace' menu. Toggle the 'hidden components button' located below the workspace options. Switch between workspaces to change the device type. As you switch, components that should not be displayed, will appear with a 50% transparency effect rather than being hidden. When in preview mode, all editing features are disabled apart from the ability to switch the current style. Toggling device type component visibility is only available when in preview mode.